These digital orthophotos provide a full-colour view of Vancouver and the Lower Mainland. The images were taken from May to July, 1995, and produced by Triathlon Inc. Each image covers an area of 13 square kilometers with one meter image resolution. Index Map Vancouver orthophoto map index is the index of Vancouver orthophotos available. Access Members of the McGill Community can obtain copies of the data by filling out the Geospatial Data Request Form. Please list desired orthophoto images (ex.E9). 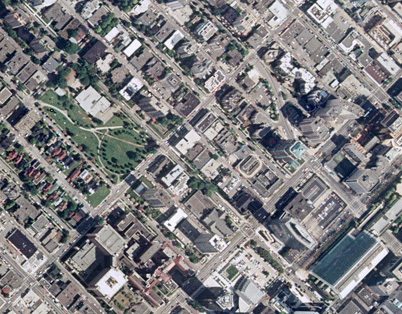 See the Vancouver orthophoto map index for the orthophoto numbers. Citation Colour Digital Orthophotos of Vancouver and Lower Mainland 1995 File number. [computer file]. Burnaby: Triathlon Mapping Corporation, .